I wanted to take a moment and share a story about Gabe that made my heart overflow with pride at the amazing young man he is becoming. A few weeks ago Gabe announced to me that he had decided to run for “Coming Home” King. It is the basketball equivalent of Homecoming at his school and serves as an all-school fundraiser for the local chapter of the Make-A-Wish Foundation. He was absolutely determined to help his school raise enough to provide a wish for a child. In previous years, his school was able to raise, at most, a little over $2,000. In the span of only two weeks, Gabe managed to personally raise $2,700! His outstanding efforts even inspired the other 8 contenders to try and match the amount he raised. 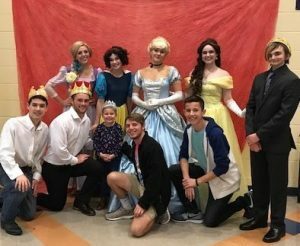 Gabe was crowned Coming Home King 2018, and his school collectively raised more than $8,000, allowing a local pediatric cancer survivor to live out her dream of going on a Disney cruise. Even when Gabe is not focused on raising funds for Chemo Duck, he is always looking for ways to give back. I am immensely proud of the young man he is becoming and I am sure you will all join me in congratulating him for his incredible hard work! This entry was posted in Newsletter and tagged Chemo Duck, chemoduck. Bookmark the permalink. Thank you, Sarah Grace Foundation! This Group is Second to None!